Are You Parenting Right ? My parenting perspectives workshops encompasses sharing researched, proven and justified parenting insights, demonstrations to show parents the dos and don'ts of parenting, as well as operative tools and strategies in action. My workshop incorporates unique “Principles for Mindful Parenting” that will guide and prepare parents for any parenting challenge. Workshops help parents deepen their connection to their children and foster love, accountability, resilience and self-respect. I guarantee participants on walking out of our workshops with new and easily usable tools that they can begin using instantly. @ Balancing Work and Family - Learn how to nurture yourself and your family so that your family supports your work. Find the balance. @ Balancing Love and Discipline - Introduces the concept of firm and kind, unconditional love and the value of more action and less talk. @ Creating Cooperative Families - Teach how to create a cooperative family or classroom atmosphere and what to do when there is a lack of cooperation. @ Effective Parent-Child Communication - Introduces the concepts of listening, Genuine Encounter Moments, handling feelings and conflict resolution. @ Enhancing Children’s Self-Esteem - Demonstrates methods of disciplining while instilling high self-esteem. @ Handling Sibling Rivalry - There is a difference between sibling rivalry and sibling conflict. Learn how to identify and correct each behaviour. @ How to Handle Children’s Feelings - Learn the effects of feeling stoppers and feeling encouragers and how to work with children’s feelings in each developmental stage. @ Effectively Handling Power Struggles - Learn how to recognize and disengage from a power struggle and what to do to lessen them in the future. @ Parent-Teen Communication - How to effectively communicate with your teen, set clear boundaries, and understand what happened to your child! @ Parenting as a Team - Discover the underlying causes of couple’s disagreements on parenting and learn how to create peaceful resolutions. @ Backtalk – Steps to Ending Rude Behaviour in Children. @ Tame Those Tantrums - Learn the concept of how less power means more. Learn how to diagnosis tantrums and prevent them. @ How To Bully-Proof your Children – This workshop covers parenting skills to bully-proof children and 6 skills to prevent bullying behaviour. Sunitaa is PCI (US) Certified Parent Coach, Classical Music Artist (Carnatic & Hindustani Vocal), Gold Medallist at Master’s Degree in Life Sciences and Bangalore, India based. She happens one of the happening parenting coaches in Bangalore (India) catering to parents of millennials since couple of years and have been making promising difference to their parenting methods, thus, aiding their progeny and complementing their satisfaction quotient in their family lives. 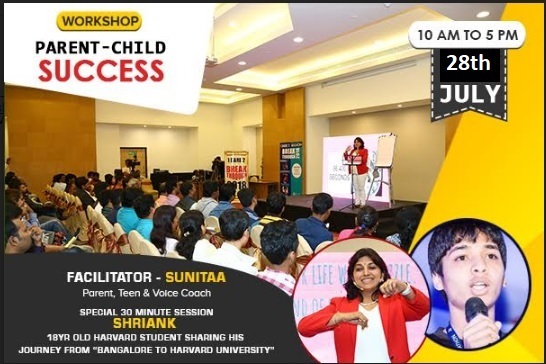 This session is complemented by her son Shriank's 30 min talk titled "Bangalore to Harvard" by 18 year Harvard University student of 2017 class, who was 1 out of 2 who made it from India. He is first lego league world champion, google science fair 2017 global finalist, is one of the two students from India who made it to Harvard University for his graduation for 2017 – 2021 class. Will look forward to see you ! You are invited to attend Are You Parenting Right ?